It’s Book Fortnight in the GFL! With a whole series of activities and events including competitions and author visits happening in the GFL over these two weeks, today was Speed Book Dating in our Senior Library where staff and students had a fun one minute to ‘sell’ their book to other contestants then rank the book presented to them from ‘doesn’t interest me’ to ‘awesome’. While competition was fierce, a great sales pitch given by English Teacher Ms Jen Yoffie of her favourite book, The Year of the Flood written by Margaret Attwood, was a clear winner! 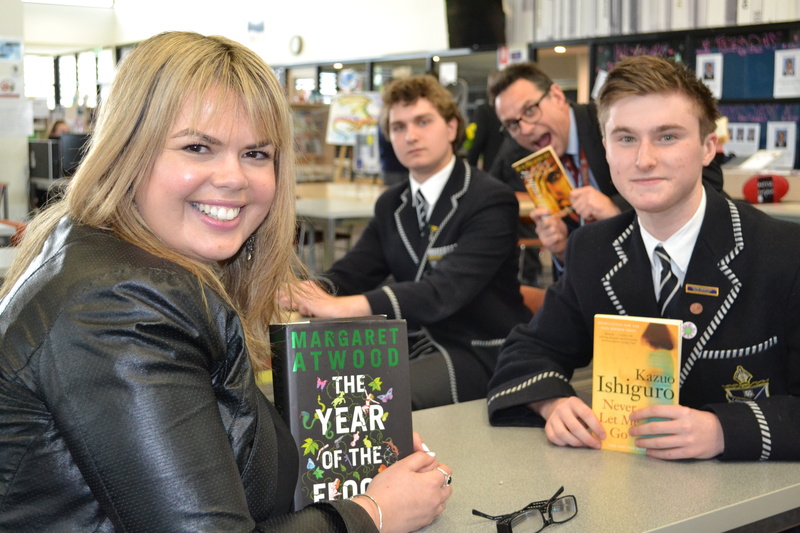 Pictured with the winning book is Ms Jen Yoffie, Alex (Year 12), Mr Henry Kiss and Robert (Year 11). Congratulations and thanks to all contestants for an awesome event! This entry was posted on Monday, August 17th, 2015 at 3:54 pm	and tagged with Speed Book Dating and posted in Book Week, Events, Reading. You can follow any responses to this entry through the RSS 2.0 feed. March – Catherine Jinks – A very peculiar plague (Book 2 City of Orphans series).